How many is 6 million? There are a lot of different ways to try and illustrate how many 6 million is. Putting the whole thing into perspective is very difficult. Even I, as an adult, can't truly fathom how many people died in the Shoah, the Holocaust. How, then, do I teach young people to comprehend it? One teacher tried with paperclips. Others have used pop-top lids, math tools, pennies, written words, and others. 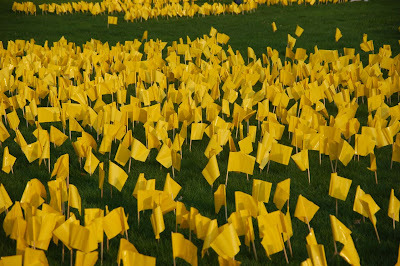 In Glencoe, we use yellow flags. A field full of them, about 5000 in all, to honor the memory of the victims of the Shoah. 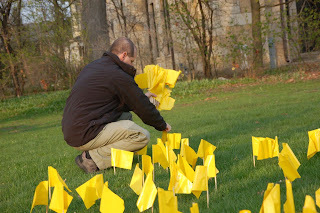 Yellow flags that draw the eye, set in the middle of town, in Kalk Park. Tonight, our 7th and 8th graders planted the field of flags. And they heard the story of a woman, Kate Lipner, who saved many Jews in France during the war. Her story...so incredible. And yet, she said "I am not a hero. I just did what I had to do." Our young people are rarely quiet. You could have heard a pin drop in the room as she spoke. If you are in the area, drive through Glencoe before Friday afternoon. The flags are near the train station. Their beauty is stunning. So were all the lives lost. Zecher tzadik livracha...may the memory of the righteous be for a blessing. 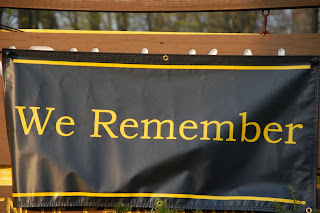 May we always remember. May we learn not to forget. I am an award-winning blogger! My matzah brei recipe won the contest over at Jewish Holiday Cooking, Jayne Cohen's blog and website. Wow. And I haven't been blogging this week. Haveil Havalim #163, the Best of The Jewish/Israeli Blogosphere is now live at Tzipiyah. Go check out all the great posts! What happened? We were so excited to end Passover on a spring-like note. Friday was a gloriously warm day, so wonderful that we spent a bit of time at the Botanic Gardens. Good thing we did because then it all seemed to go downhill! Saturday and Sunday were cold and blustery...we still managed to get outside a bit, but nothing like the glory of Friday. Here are some of my favorites, I couldn't pick! The Girl, discovering the bushes at the Gardens...this was before she tried to eat them, of course. Sam loves water, and here he is heading off to his favorite fountains. Even after a winter away, he still remembers what he likes! For a kid who loves water, the Chicago Botanic Gardens are a great place to be! It's very hard to keep him out of the water and still take pictures. After this shot, he basically tried to dive right in! But I love the splash effect here. I tried to take some pictures of him visiting with the ducks, but I was so afraid that he would go for a swim in the lake that I had to keep one hand holding tightly to the back of his shirt as he reached for a gorgeous pair of mallard ducks that were swimming right by us. He did enjoy meeting those ducks! I think sometimes he wishes he were a duck...he does like water. What did you do to celebrate the end of Passover over this weekend? The Bloggers helping Jeni auction is now up and running, arranged by the amazing Bella. This is an amazing opportunity to help out Jen Ballantyne, who blogs here at The Comfy Place. She is currently in hospice but still blogging, her latest post was about how much she wants to help others. Go check out the auction by clicking here to go straight to the ebay store they have set up. The auction will be up and running until Thursday, May 1st. Family car stickers ...I had no idea I was such a trend-setter? follower? read here and here too. want me to send some? 9. No Matzah for Me! There is some cool stuff going on in blogland this week. Jen is going to Rwanda. It's pretty neat what she's doing. You can help her out...be part of a Hope Revolution. The Crunchy Domestic Goddess is giving away an amazing array of earth-friendly stuff in honor of Mother's Day and Earth Day. Go check her out! Don't forget that 60bloggers is still going strong, celebrating Israel each day with a post from a different blogger. Mine was up on Monday! What have you seen around the blog-world that is cool? - Saute onions in the pan before you add the matzah/egg mixture. - Saute the onions. Add some lox (smoked salmon) to the matzah/egg mixture and cook. - After it's mostly cooked up, add about a cup of pico de gallo and a few handfuls of shredded cheese. Mix well, until warm through, and serve with guacamole, salsa, and sour cream. - Saute spinach, mushrooms, artichokes, you name it and add in. Add a little garlic too. Why not? - Add cream cheese, lox and green onions into the cooked matzah brei. - Add cinnamon and sugar to the matzah/egg mixture. - Soak the matzah in warm apple juice instead of water. Add few dashes of vanilla and cinnamon to the matzah/egg mixture. - Chocolate chips go over huge. - Chop up strawberries, mangos, bananas, etc and add to the matzah/egg mixture before cooking. - Toppings: chocolate syrup, melted white chocolate chips, caramel sauce, raspberry sauce, dust with powdered sugar...use your imagination!!!! - Some people use Matzah farfel to make it, which is actually just pre-crushed matzah. Why do they sell this stuff? We can just break up our own, you know. Sometimes the farfel is finer/softer than regular matzah but this year it is clearly just broken-up matzah. Whatever. Each year we have a Matzah brei cook-off at our synagogue on the first day of Pesach, before services. I, ahem, have been the winner on a couple of occasions...I make a mean matzah brei. The other night I had it with lox and onions and then, um, added maple syrup. It might sound weird but that's how I like it! This year I made the Mexican variation at our temple event and it was a huge hit. That's what works for me. How 'bout you? I'm absolutely thrilled to announce that my newest book, Go Green, Live Rich is an instant bestseller, debuting on both the New York Times and Wall Street Journal Bestseller lists! This is huge news because as far as we know, this is the first time a book on the environment ever opened on the NY Times bestseller list. So thank you so much for helping to make this happen! I also want to invite you to help us celebrate Earth Day with a very special offer. We've teamed up with our friends at Amazon.com and Sony, to offer a FREE download of Go Green, Live Rich: 50 Simple Ways to Save the Earth (and Get Rich Trying). That's right! For today only you can download the book absolutely free. Here's all you need to do to get your free download. If you're an Amazon Kindle user, head over to Amazon.com or search Go Green, Live Rich directly from your Kindle and start your download from there. Remember, this offer is good for today only! And please feel free to share it with family and friends! ...but doesn't it feel stressful when the ads on your blog are for PASTA!? No, seriously, it does seem like the whole world is not with us during Pesach. Everywhere I go, everything I see, I am aware more than ever during the year that I am separate. We can't just stop for a snack...keeping Passover doesn't bother me. Eating chametz-free isn't the difficult part. It's figuring out how to keep it together in a world that isn't on break, doesn't remember or think about what we are thinking about. This is when I miss living in Israel, when it really felt like the whole world was Jewish, the whole world revolved around me and my Pesadik needs...like my friend FrumeSarah, I too feel a bit of discontent at this time of the year. I love Pesach. I love Jewish life. I sometimes just wish it wasn't quite so hard. And you know it must be when even the rabbi-mom says so. We came from Egypt, what did you do this weekend? Who are you? I am Israel. Where are you coming from? I am coming from Mitzrayim, from Egypt. Where are you going? I am going to Yerushalayim, to Jerusalem. We went out of Egypt and into Jerusalem as we celebrated the beginning of Pesach. Those of you who follow my blog regularly know that I've been getting ready for weeks! The time has come, and all the hard work and preparation paid off. Our Seders were wonderful. My dad was so proud of my award-winning post that he printed it out for the whole family! David was such a hit! He sat right next to my dad, who ran the Seder, and he recited the Four Questions...plus he sang a whole bunch of cute songs including a great version of Who Knows One that made the whole family roll with laughter. Such kvelling, such naches! For the Second Seder, it was just our immediate family and we sang songs and did a really brief service. It wore everyone out! ...and to all a Chag Sameach! It has been a wild week for me in blog-land. I won a cookbook from Nosh with Me. Wow. I need a break. So...chag sameach (that's Happy Holiday), a zissen Pesach (a sweet Passover), and Shabbat Shalom. May this holiday of freedom bring the blessings of hope and peace to our whole world. A final Pesach treat...here's a funny new song from Michelle Citrin. front page of her blog! and she picked me too! make sure you go see. Thanks for the amazing opportunity, Bella! It was such a joy to answer such thoughtful and thought-provoking questions. I really look forward to our meeting in "real life" too! Shabbat Shalom and Chag Sameach (a happy Passover) to all! 1. Are you worried about feeding your goldfish this year? In case you are, here is some information on how to make sure that even your fish's diet is appropriately chametz-free. 2. Passover can be, um, binding. One good way to ensure that you stay, um, regular, is to eat dried fruit, or even better -- fruit compote. A yummy recipe: 4 lbs m ixed dried fruits, 1 1/2 cups orange juice, 1 1/2 cups water, 1/2 cup sugar, one piece of cinnamon stick or cinnamon powder to taste, peel of one lemon, left in one or more large pieces. Remove the sulfates in the dried fruit first: pour boiling water over the fruit and let stand for at least 1 hour. Drain thoroughly. Put the fruit in a large pot, with all of the ingredients. Bring to a boil, then lower the heat and simmer gently for 30-45 minutes until tender. Cool in the saucepan, remove the lemon peel, and store it in the fridge, covered tightly. It will keep for a long long time. Unless you eat it all. 3. Don't screw up and buy the wrong kind of matzah. FrumeSarah, I'm embarrassed to say that this is what I fell for. Here's how the story goes. This year, Manishewitz isn't making Tam Tams. For those of you who don't know, Tam Tams are wonderful, yummy, not-low-cal crackers made Kosher for Passover each year. They are my family's favorite Pesach food. What I didn't realize was that they wer e also not making any cracker-shaped matzah stuff this year. I had no idea. I'm a little slow. I thought to myself, maybe I'm just late to the party and it's all been bought at my local stores (did anyone get any???). So I went online to Amazon. I got really excited to find this. I bought it. Late at night, I suddenly realized that this was NOT the Kosher for Passover stuff. Why do they make chametz-dik matzah? Please explain this to me, Manishewitz! I knew this -- I always check my matzah in the store. But online...I got so excited by the matzah cracker shape that I bought ...get this... 12 boxes. Yep, that's how it's sold on Amazon. By the case. 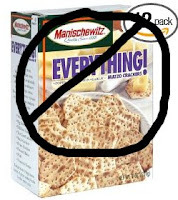 My husband got a good laugh that I had just spent hours cleaning my pantry of all the chametz and I went and bought 12 boxes of the stuff. Lovely. Food pantry? 4. If you aren't done yet with the cleaning thing, check out A Mother in Israel's great checklist. I always forget the cars. 5. Check out this beautiful handout from Storahtelling. Try their Leap for Freedom game. It's great! 6. Looking for a new Haggadah? Want some games or stories or ideas for the Seder? They're all over, people. 7. Passover isn't always the most "Green" of holidays - we throw out stuff, we clean frantically, we might use a lot of disposables or papergoods. So here is Hazon's take on sustainable Passover resources. 8. Why put an orange or other innovation on your seder plate? There are a couple of explanations for this - although it's typically thought of as a feminist statement - I like to think of it as inclusive and adding something new to the seder to keep it lively, interesting, and modern. Here are two different opinions and ideas about this, both of which are thought-provoking and interesting. What do you do to make your seder new each year? Plus this very cool ASL version of the Four Questions. 10. Even though the Passover seder talks about our redemption from Egypt, the need for freedom in our world is still ongoing. Here is a wonderful Seder addition from American Jewish World Service, imploring us to remember those in Darfur who are not free from fear and terror. 13. Make sure you look up on Seder night. Hopefully the sky will be clear and you can see the beautiful full moon. The beautiful fullness represents, I believe, the beautiful fullness of Jewish life, especially on this night, the night that so many Jews and friends around the world are sharing in the Feast of Freedom. What an amazing moment for us all to know that we are all telling the same story, we are all re-living the dramatic moment in which we celebrated the understanding of the true meaning of freedom. May this holiday bring joy and peace. Chag sameach! Using Hogdsen Mills Whole Wheat mix, I follow the directions for "apple pancakes" and add a cup of applesauce (or whatever mushed up fruit I can find, I used up some leftover babyfood bananas and prunes once too! ), instead of regular oil, I use flaxseed oil, and I add some cocoa powder and cinnamon for a kick. Plus, of course, a few chocolate chips in each pancake. That way the kids think they're getting a treat and I know they're getting a really healthy breakfast! Plus, they keep really well in the fridge or freezer...and of course they taste great. Even better with some fake sausage on the side. That's what works for me today. Come back tomorrow for some great last-minute Passover tips! not ready for Goodwill yet. add a little flower and it's like new again. Haveil Havalim #162 - Pesah Edition is up over at Esser Agaroth... and it's great!!! All a very interesting sociological explanation...right? But in practice, it's not something that I've ever done. My oldest child, a boy, had his first haircut at about 7 months old. His beautiful curls were definitely getting in his way and when the daycare started putting little bows in his hair, I knew it was time. My second, I held off until about a year, but he too was bothered by hair in his eyes. No one will bother me about her hair, I thought to myself. But remarkably, they did! "It's in her eyes!" "How can she see?" and..."couldn't she choke on that cute little hairclip in her hair if she pulled it out?" The boys desperately needed haircuts this weekend...so we snuck them in Friday afternoon before naptime...and while we were there, I took a deep breath and said, "okay, the bangs!" But I insisted that it wasn't the "First Haircut." (which saved me a lot of money, incidentally, they only charged us 5 bucks!) I didn't even bring the camera because I was not sure I was going to go through with it. Combine ingredients in a bowl. Butter/grease a casserole dish. Transfer mix to casserole, bake at 350 degrees for about 45 minutes until brown on top and bubbly around the edges. Delicious! What's your favorite recipe for Pesach? Want Obama at your Seder? from my del.icio.us...where have you been this week? This week's Torah portion is Metzora, but usually it is read along with last week's parasha, Tazria. Since I missed last week's haiku-ing (no good Internet hookup at camp), here are both portions together in one...in all their yucky fun! make you pure or not. and have to be checked. Wash the fabric, check again. You want it all pure. to fix it right up. and the priest can fix. that can make you impure. back to a pure state. See more (probably less gross) haikus here. 2. Celebrate Passover, put together by Craig Taubman, a little eclectic but worth a listen. 3. Reggae Passover do I need to say more? 10. Peri Smilow and the Freedom Music Project - she is great! 12. Rabbi Joe Black's Alef-Bet Boogie has 2 great Passover songs: Afikomen Mambo and a nice version of Dayenu. 13. And don't I wish some of these Chanukah cd's had Passover versions????? What Passover music do you like? How do you get your family in the Pesach mood? P.S. Looking for How to Lead a Seder? Check out my guide on Amazon. More coming...it's that time of year! I see....one woman in a down coat...and another in a tank top? Well, the sky is blue, the sun is shining. We bought my daughter, Yael, her first pair of shoes yesterday. New shoes are an exciting thing. 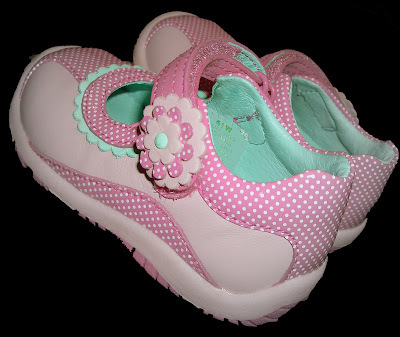 The *first* pair of shoes is even moreso. She will walk many steps in her lifetime. Will she walk towards goodness? Will she run to help others? Will her feet carry her forward into a life filled with passion? May she walk in right paths. And may her shoes always sparkle. Mother-in-Israel has posted the Kosher Cooking Carnival #29 today -- it's fantastic! All about preparing for Pesach...go over and see! Each year I am blessed to spend a long weekend with an amazing group of ladies at the Devorah Jewish Quilting Kallah* at Olin-Sang-Ruby Union Institute. We spend a whole weekend celebrating our creativity and our ability to be artists, in whatever capacity that is for each of us. Everyone brings their sewing machines, piles of fabric, thread, needles, beads, ribbons, rotary cutters, lamps...you name it. I definitely pack more for the quilting studio than I do to wear! I didn't take a lot of pictures, but I was thinking of how to fully explain the event here on my blog. Why quilting? Why Jewish quilting? Most people expressed it this way: we have quilting friends, we have Jewish friends, but there aren't so many avenues to put them both together. This is an awesome opportunity for women to gather from all over and share both their faith and their art. And that is marvelous. The atmosphere is thick with creative juices and we manage to eat some pretty good ice cream too! We study, we sew, we sew, we pray, we talk and laugh and cry (and unfortunately, sew our fingers into the machines occasionally and end up at the ER!) and eat (and eat and eat), we walk and we talk and we sing and sometimes even dance. It's quite a remarkable group and a remarkable weekend. I ♥ a greener Target! Seriously, though, doesn't everyone ♥ Target? 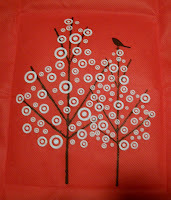 And now even moreso...because Target has...reusable shopping bags! Not only that, but they're cute and red. 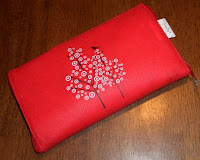 AND they have, along with the usual flat-bottomed ones, ones that zipper back into a handy little pouch that fits nicely into my purse. Oh...I think I've gone to Target heaven! Why is no one making a bigger deal of this!? 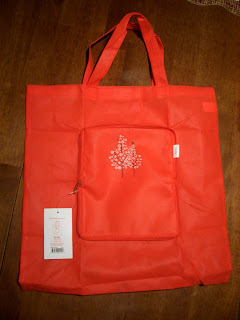 But...I must admit, the checkout clerk tried to put my re-usable bags into the plastic ones. We straightened that out right quick. She did put the ice cream into a little plastic bag before I caught her (didn't notice until I got home) but I guess that's okay. This week's Works for Me Wednesday is a "Greatest Hits edition." My post here is basically a continuation of this one, which I think was one of my favorite WFMW posts. What works for you? As I've said before...it's that time of year. Yes, Pesach is just around the corner. For many Jews, this season brings a little bit of fear. Fear of the work, fear of not getting it all done, fear of the family get-together, fear of the week's worth of strange food. For me, it is a season to savor. I love the the preparations, I love the cooking and the cleaning and the shopping. I love knowing that this is happening all over the Jewish world. I love knowing that generations of Jewish women before me have embarked on the journey of getting the house ready for Pesach. I love the learning and the study that I do each year. Re-reading the Haggadah, looking for new stories and ideas for the Seder, finding new recipes, learning new songs. Just as the spring begins to blossom, I find the chance to renew myself in this holiday. The cycle of the year feels so right to me. My body, my heart, my mind, my home, are all ready for spring to be here, and all ready for Pesach to come in with its cleansing effect...body and soul. I'm ready! 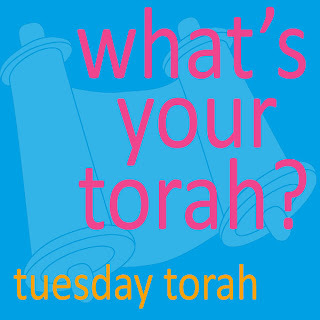 What's your torah this week? Leave a comment and join in. Written also as part of MamaBlogga's March/April Group Writing Project "Savoring the Season." Why don't you join in too?